WYTHEVILLE, Va. – Over the past 48 hours a string of violent storms have torn through the southeast, causing numerous fatalities in multiple states. This afternoon, tornado warnings were issued for a handful of Virginia counties west of Wythe and as the evening progresses the threat of additional storms will increase for the County of Wythe. As a precaution, the Wythe County departments of public information and emergency management are seeking to remind local residents of important safety tips to follow in the event of a tornado. WYTHEVILLE, Va. – Last summer, Wythe County’s combined emergency communications center began taking calls for the first time. The project was a join effort between the county and towns of Rural Retreat and Wytheville, made possible by hundreds of thousands of dollars in grant funding. Consolidating the emergency dispatch centers from all three jurisdictions gave local leaders an unprecedented opportunity to implement more advanced tools; while at the same time splitting the high costs associated with manning a 24-7 emergency call center. 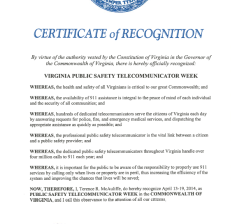 Nearly a year into the transitioning process, county officials are praising the move and celebrating National Public Safety Telecommunicator’s Week. WYTHEVILLE, Va. – In 2012, the Wythe County Board of Supervisors voted to eliminate the county’s windshield decal beginning January 1, 2014. The decals were replaced with a license fee that is now added to resident’s personal property tax bill. Many local residents, however, have chosen not to remove their old county stickers; which expired in December. Over the weekend, an erroneous rumor began on Facebook, alleging that county residents were being fined for not removing these decals. 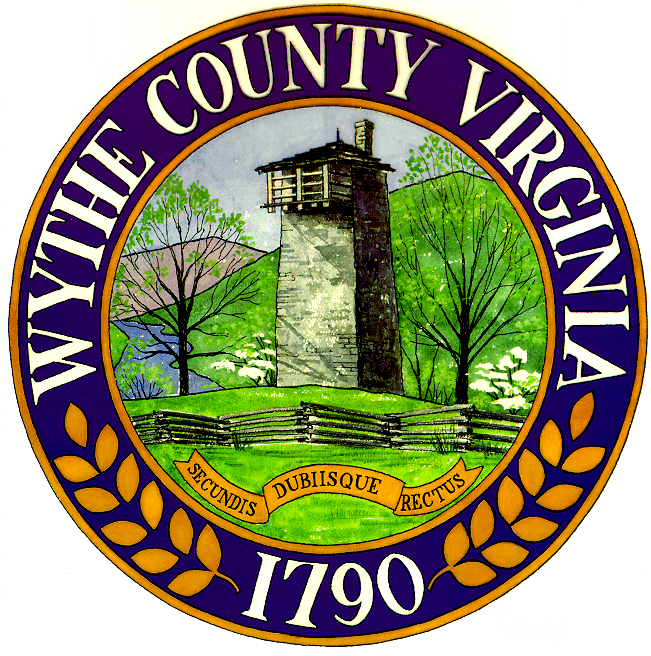 County officials reached out to Doug King, Wythe County’s Sheriff, as well as leaders from within the Virginia State Police who have all stated that their officers have not and will not be issuing any citations to motorists displaying the 2013 Wythe County decal. WYTHEVILLE, Va. – Wythe County officials are encouraging local dog owners to ensure their pets have been properly vaccinated for rabies; as a recent outbreak of the zoonotic disease has been noted by the county’s animal control department. Arlan Dunford, supervisor of Wythe County Animal Control, says that health officials have recently processed an above average number of rabid animals – a trend he says places local pets in danger. “Rabies is a very serious and fatal disease. Pets lacking current vaccinations run the risk of being infected,” stated Dunford. According to the World Health Organization, the disease can be spread to people through close contact with infected animals, usually saliva, via bites or scratches.